When I had the opportunity to choose from Baukjen's collection, it was tough to narrow it down to one item but this cobalt maxi wrap dress was a true beauty and absolute stunner. The satin detailing on the shoulders and the slit gave a rather ordinary maxi a true touch of elegance. Exciting news -- The Daileigh is featured in the November issue of Lucky Magazine so go pick up your copy! congrats on your feature! girl u are KILLING it in this dress! u are so ready to walk down a red carpet!!!! Gorgeous dress! Congrats on the feature in Lucky Mag! congrats! the dress looks good on you! The dress is gorgeous. That necklace rocks. In short, you look fabulous. Congrats on the feature and OMG this dress is stunning on you. I love the high slit! This is so stunning! The color is gorgeous! This cobalt wrap looks beautiful on you:)! 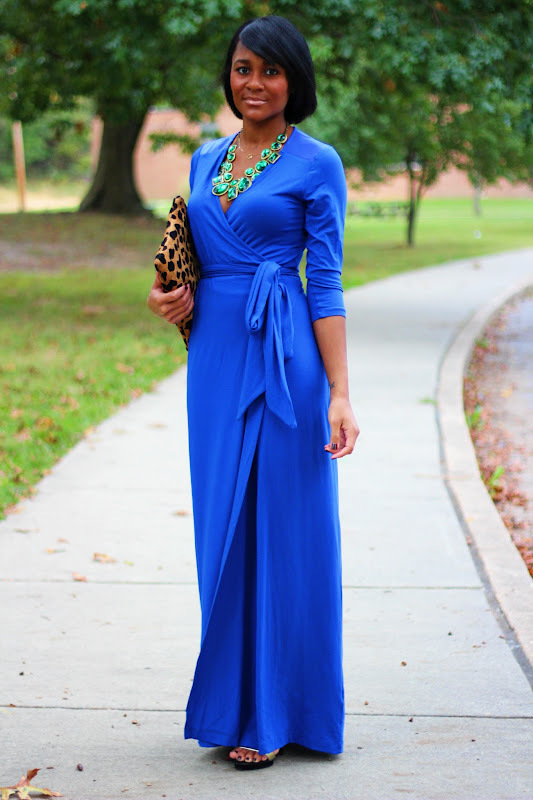 you look amazing in this cobalt maxi! love! Wow that dress is gorgeous! and it looks even better on you! I am in love with this dress. Just stunning! Ashleigh, you look drop dead gorgeous. You are always so classy and this color looks amazing on your skin. Plus, you accessorized perfectly... Perfection. Fun dress! And that clutch is absolutely gorgeous! You look beautiful, the dress is gorgeous!! Amazing outfit! I love everything about! I am a huge fan of wrap dresses too! So glad to have found your blog! Congrats, that's amazing! You look stunning. Amazing, just amazing...the collar, the dress, the handbang ¡the outfit! Wow! You are so rocking this outfit and I just love your necklace. Absolutely fabulous! I will definitely visit your blog often. ohhhhh myyyyyy ohhh myy, you look so stunningly beautiful in this! WOW! WOW! That color against your skin is awesome. That dress paired with the necklace and the bag... home run! LOVE! stunning dress and congrats on lucky! The Lucky feature is so exciting! Love the slit, it's stunning, as well as the shade of cobalt! This dress is stunning on you!! That slit really finishes it off and makes it perfect! You look amazing!! Beautiful dress!! That dress looks amazing on you! So gorgeous! The cobalt blue is such a gorgeous color on you, it's definitely in all the stores this season. Wow, this is just all around gorgeous! lol im loving your blog soo far!! I would have never thought of pairing together some of the things u have but they look reall good! OMG!! I am IN LOVE with your dress! OMG!!! New to your blog but I absolutely love this look!!!! Werk mam! !